As the first day of our research trip ended, we packed up our gear at the Montgomery County, NY Archives and headed for the car. Our day was not over just yet. We had cemeteries and homesteads to visit before we could rest. The first homestead on our list was that of John Edwards, the grandfather of my Dad’s grandfather. If I’m not mistaken that makes him my 3rd great grandfather. John was born in 1792 in Germantown, New York to our otherwise elusive immigrant ancestor, William Edwards from Wales and his 3rd generation American Palatine wife, Christina. Sometime around 1810 John followed his family members who had already settled in Charleston (later Glen) New York. John married a Dutch girl, Ann Van Schaick in 1816. They settled on what is now Argesinger Road in Glen and had nine children. Having a copy of John’s will, I knew that the property had been sold out of the family after his death. But I was keen to see it none-the-less. The Argesinger brothers had bought it after the Edwards family sold it. I had been contacted by the children of one of the Argesingers but I wasn’t sure if they still owned it or not. The folks at the Archives had told us that the Amish were buying up many farms in the area. Caution signs with pictures of horse drawn carriages randomly appeared along the streets. We were also told that the Amish built new houses and barns rather than using the ones that existed. In this very old place where time stood still is was easy to pick out the farms that the Amish bought. Dad and I came to the spot where John Edwards' homestead should have stood. Instead of a home on the north side of the road there was a little small, new, not particularly attractive construction. Yet the barn across the road matched the one in the photo the Argesinger relatives had given us. An Amish young man happened to be walking along the way. We pulled our car over and the young Amish man waited for us. Despite that he was no more than 20 years old he had a full beard. His long sleeve button down shirt was of a rich deep blue hue. His dark pants were secured by buttons only. No zippers or snaps in sight. I explained to him that we had a photo of his barn that was taken in 1937. I showed him the photo and he agreed it was his barn. We explained that our ancestors had settled this land and built the house and cleared the farm. We were hoping to learn more about it and take a current photo of the barn. The young Amish man signaled to the distance where his father and brother were. He said he would ask his father. We walked toward them. His father was up an apple tree. My family had harvested apples when they lived on this land too. The father came down off the ladder to see what all the fuss was about. He looked at the photo from 1937. We explained again about how our ancestors settled this land. Dad and I weren’t sure if our comments had any impact on him. We made introductions, Marian Pierre-Louis, George Edwards, Ben Miller. He seemed intrigued by the photo. He explained that the original barn had burned down in 1908 or 1909. The barn that my ancestor had built. This replacement was built by the Argesinger Brothers in 1910 or so. He said the year was written on the barn somewhere. He agreed to let us take a photo of the barn. Over the ensuing hour we learned that Ben cared about the history of this place as well. He sent his son back to the house to find the packet of deeds to the property. Ben also had photos that previous owners had taken. Some of them contained photos of John Edwards house that was no longer standing. In a funny twist of modern world meets the Amish, we took digital photos of their old photos of the homestead as well as the deeds relating to our family. Ben was going to give us the photos but then thought better that his wife might like to keep them. Dad chastised me later for not taking them. But I understood how Ben’s wife might feel and wanted her to keep the photos. On our way out we took some photos of the farm, but not of the Millers. 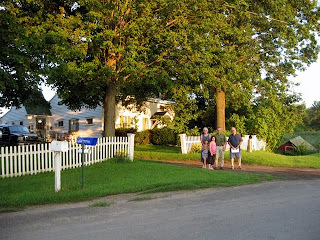 I was satisfied visiting the original homestead of my Edwards family in New York. While I didn’t get to see the home where John Edwards once lived I did enjoying viewing his farm and the land he cleared. The connection to the land was still strong and I went away fulfilled. Grandma Peterson got started right away introducing her new granddaughter Peggy to the affairs of the family. Her first order of business was to describe her six week trip to Germany with Peggy’s Aunt Lyda. The introduction was done in the form of a recycled Christmas Card. The card was sent to Peggy’s mother to celebrate the birth of Peggy. Margaret (McCain) Peterson was Peggy’s paternal grandmother. Born in January 1868 in Pennsylvania she was the child or grandchild of Irish immigrants. US Federal Census records show conflicting information regarding the places of her parents’ births. About 1892 Margaret married Edwin Lewis Peterson. They had at least three children: Cora born in 1893, Lyda born in 1896 and Peggy’s father, Edwin Jr., born in 1902. You might think a recycled Christmas card would be a strange thing to send someone when they have a baby. But something more is going on here. Peggy was born in June 1940. The Christmas card was sent from Germany in 1928. Clearly the card was important enough to save for those 12 years. Why did Peggy’s Grandmother choose to send it at her birth? 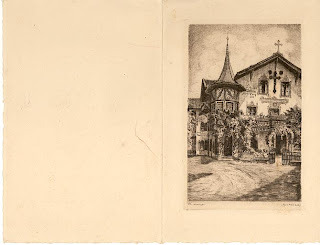 The front of the Christmas/birth card shows an etching of Pension Daheim, Haus Anton Lang, No. 19 in Oberammergau. The e tching is of a beautiful home with a turret on one side and Crosses in numerous places, including the roof. The inside of the card presents a lengthy poem/ Christmas greeting in English from Anton and Mathilde Lang of Pension Daheim, Oberammergau. 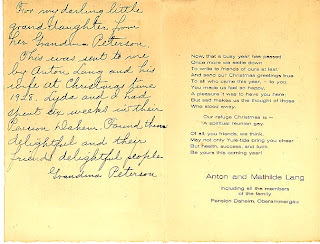 What was so special about Pension Daheim and the Langs that Grandma wanted to share with her granddaughter? Well, it turns out Anton Lang was very special indeed. Anton was born in Oberammergau in 1877, the son of Rochus Lang, a potter. Obergammergau is the site of a passion play peformed every ten years. According to Wikipedia, “The town vowed that if God were to spare them from the effects of the bubonic plague ravaging the region, they would perform a play every ten years depicting the life and death of Jesus.” In 1633 the village believed they were spared from the plague and performed their first play in 1634. According to the same source, the “most recent performance took place in 2000 and the next will be…in 2010." Perhaps Grandma Peterson had seen one of the Passion Plays herself or perhaps she was taken by the kindness of the Langs. Either way the event impacted her life in such a way that she wanted to share it right away with her new granddaughter. A few years back I received a box of orphan heirlooms. Not orphans exactly. They belonged to my mom’s cousin, Peggy. Peggy died in 2002 without any children to pass the cards onto. I can’t recall the circumstances exactly. I believe her husband contacted me hoping that I would take the cards because he didn’t want to throw them out. The genealogist in me couldn’t bear that thought so I took them. I knew only too well that the time would come for me to find another home for them. I’ve decided to post these cards on my blog in hopes that descendants of the senders will discover the posts. Then perhaps they will contact me so that I can send them the originals. Or perhaps an organization will request the collection as a whole. From my brief first look I can tell this is going to be a fascinating journey. Cousin Peggy was born Margaret Ann Peterson on June 3, 1940 in Pittsburgh, Pennsylvania. She was born to renowned University of Pittsburgh English Professor, Edwin Lewis Peterson. Professor Peterson, author of Penns Woods West (1959), had a reputation as a writer’s writer. He inspired a generation of American authors who came up through the ranks of his classroom. His classroom was in the Early American Room at Pitt. My mother told me years later after his death the Early American Room was no longer open to the pubic. But my mom was a determined woman and as the niece of Professor Peterson she would not be kept out. She said the holes were still in the walls or floors were she and Peggy as children peaked through while the professor was lecturing. While I don’t have a living memory of “Uncle Petie”, his legacy impacted me growing up and I was always awed and inspired by the man who corresponded with Ernest Hemingway. Peggy’s mother was Helen Naomi Silver. One of the three Silver sisters. My great aunt Helen was refined and well traveled. She spoiled me when I came to visit. She would give me secret gifts that only the two of us were to know about. They were always exotic gifts such as pencils with Chinamen and tassels on top. Little treasures only a child could adore. One year she gave me her passport travel case. She had no idea what she was setting into motion with that gift. Little did she know that someday I would follow much too closely in her footsteps. Peggy was an only child. She was a magical, mystical cousin. We didn’t see her very often. As an artist she seemed to me, a child, to be very Bohemian. One year in Philadelphia she took all the kids of my generation to the Museum of Art. She wore a t-shirt that showed all the bones and muscles and tendons of the torso. It was quirky moments like these that left me with brief but fanciful memories of Peggy. My mother took the traditional path in life – getting married, having children and becoming a housewife. Despite their lifestyle differences, Mom and Peggy remained close throughout their lives. Long phone calls helped shave the distance between Connecticut and Spain, San Francisco, Missouri or where ever Peggy happened to be. When Peggy died in 2002, much too young at 62, she left behind her art and a cousin who mourned to see her go. How do we honor the lives of those who don’t leave behind flesh and blood to carry on their genes? We remember them and in those memories we continue to celebrate their lives. Though my memories of Peggy are few, I am excited about the journey of rediscovering her. And discovering the people who celebrated the birth of her life many years ago.